Part 1 offered an overview of the entire paper and what to expect in coming blogs. Part 2 will give a detailed account of various coating application methods. Part 3 will wrap the series up with design considerations in hot melt application systems and offer a brief conclusion. Much like the application of conventional coatings, there are several methods available for the application of hot melt coatings. Sketch #1 shows four such methods that are used to apply these coatings. Each of these methods has distinct operating conditions and limitations, which can be related to several factors including coating viscosity, as demonstrated in Chart #1, coating thickness, as demonstrated in Chart #2 and coating speed, as demonstrated in Chart #3. The most common method of applying hot melt coatings is slot die. As seen in above referenced charts, this method can be used over a wide range of viscosities and speeds as well as most commonly applied thicknesses. With their ability to be locally profiled, dies offer excellent cross web accuracies, especially when used in tandem with inline gauging systems. Slot die coating is a closed system, with the coating being delivered directly from the pump system through the enclosed die and onto the web. This system is excellent for limiting the oxidation of the coating. Because of their design and ease of operation, they are particularly useful in systems where a specific coating is applied on a continuous basis. Die systems do have a few drawbacks. Since their internals are optimized for a particular set of operating parameters, dies do not handle large variations in coating parameters well. Because the coating rate fed to the die is pre-metered, the delivery systems are costly. Additionally, high levels of filtration are required in order to prevent contaminates from being stuck in the die. Changing of coating widths, (which requires a change in shims), and cleaning of a die at the end of a run or for coating changeovers, can be cumbersome and time consuming. Dies are also not good when trying to surface coat open webs since the pressure generated at the point of application results in strikethrough/penetration. 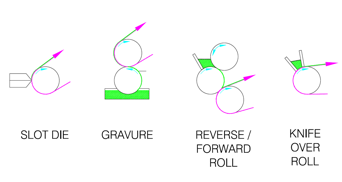 Roll coating, be it forward or reverse, is another way of applying hot melt coatings. Though limited in their range of viscosities, thicknesses and speeds, these coaters do offer certain advantages. They are easy to operate and clean up and lend themselves particularly well to changes in coating application rates and widths. Because they feature open coating systems, the delivery equipment can be relatively inexpensive and do not require a high degree of filtration. They are particularly useful for the surface coating of open webs. Roll coaters have a number of drawbacks as well. These systems are not good for applying very low coat weights or viscosities. They do not offer the ability for local profile control. Because the feed system is open, the coatings are subject to oxidation. Since the coating contacts several parts during the application process, a large amount of energy is required to keep these parts heated. Additionally, initial heat up of these coaters can be very time consuming. 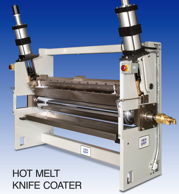 Another method of applying hot melts is via a gravure coater. These systems offer several advantages including ease of operation and very consistent coating profiles. They are particularly useful in applications where partial coating coverage is preferred. Like the roll coaters previously discussed, these coaters feature open coating systems and therefore relatively inexpensive delivery systems without the need for high degrees of filtration. However, because it is an open system, oxidation of the coating is a concern. As shown on the included charts, these systems are very limited in their range of viscosities and coating application rates and fairly limited when it comes to speed. Changes in coating application rates can be rather cumbersome and time consuming, requiring a change in the engraved roll. Because doctor blade systems are required, wear of both the blade and the roll can be an issue. Knife coaters can also be used for applying hot melts. This method of application offers several advantages including the ability to apply very high coating thicknesses and local profile control. These systems are easy to operate and to make changes in coating application rates and widths. The equipment typically represents a lower capital cost. Like the previous two methods, open coating systems are used. Therefore relatively inexpensive delivery systems without the need for high degrees of filtration are incorporated. However, like the previous systems, oxidation of the coating is a concern. Though these systems cover a fairly large range of viscosities, they are limited in their speed. Also, as with all knife coaters, the coating application rate varies with changes in the substrates thickness. Similar to roll coaters, a large amount of energy is expended keeping the coating system at temperature and initial heat up can be very time consuming. In addition to the above mentioned coating systems, there are several other methods that have been used in applying hot melts including curtain coating, spray coating and powder dispersion, all of which offer certain advantages and disadvantages.